Back In Time will take you all the way back to the Big Bang and lead you through the formation of the Solar System, Jurassic period, the commencement of human evolution, and deliver us to the present day. This app is unique in the way it presents what many would regard as general knowledge topics into a very concise and easy to follow process. People at all ages yearning to know more about the genesis of our universe and corresponding procession through time will be thoroughly engrossed with this app. An analogue clock face is used as your initial navigation through time, with the history of the universe being condensed into a 24 hour period. Presenting history via this method results in human evolution only commencing a mere 16 seconds ago. The developer has made sure that their documentary content is placed on a general knowledge scale, rather than hindering the audience with more information than they need access to. 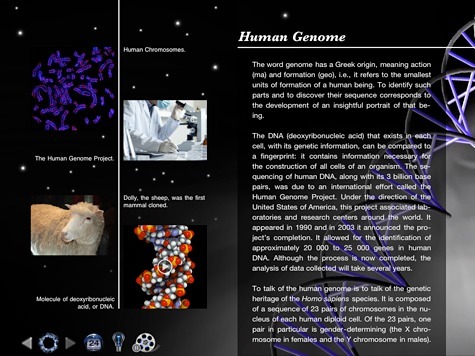 This allows users of all ages, even with basic literacy skills, to partake in a understanding of our history. The information presented is brief for each occurrence but is historically accurate. It is delivered in such a way that the most important elements are clearly expressed. At no time do you feel like you have been given access to only some of the available information. Whilst at the same time the information generally leaves you wanting more if you are interested in a specific topic. With any reference material the most important consideration is in the validity of the content. After discussing with the developer their sources of information it was made clear that this app does not simply reference a site such as Wikipedia. Instead they have a series of in-house and external writers. Contributors are also experts in their particular field and the app does list their credentials in the credits. Each contributor also accounts for his or her own bibliography and references. The app also comes with the ability to change the default English language to: Español, Português, Français, and Deutsch. This change is done in a dedicated settings panel. It is fantastic to see this universal compatibility in a version one app. You will be blown away with the quality of graphics and photographs that complement the factual information put forth. Photographs can be increased to near full screen resolution and video is also included to further highlight certain topics. There is not a lot of video currently in the application but the video that is present is useful and relevant. The app also has atmospheric music playing in the background that suits the subject matter. There is the ability to turn this audio presentation off if you don’t wish to listen to the orchestral soundtrack. Each period in history is presented with photographs and video content to the left hand side of the display whilst the accompanying text is on the right hand side. The text will scroll smoothly until the end of the content has been reached. One of the nice design features in the app is the graphic elements will flip to present additional visual content. This has allowed the developer to clearly place a reasonable amount of content on each page whilst still keeping all content clean and concise. Big Bang, First Stars, Milky Way, Solar System, The Moon, Oceans On Earth, Origin Of Life, Great Oxigenation Event, Snowball Earth, Multicellular Life, Cambrian Explosion, Land Plants, Insects, Colonization Of Land, Pangaea, and the Rise Of Dinosaurs. 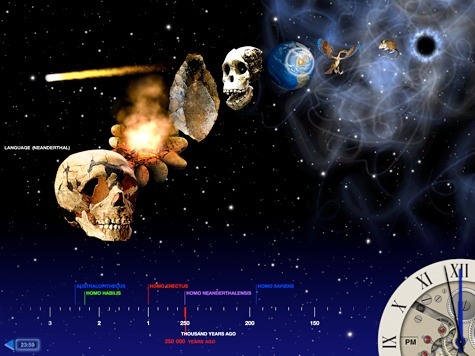 Also included is: First Mammals, Origin Of Birds, K-T Extinction, Cradle Of Humankind, Tools (Homo Habilis), Fire (Homo Erectus), Language (Neanderthal), Homo Sapiens, Human Migrations, Cradle Of Civilzation, Invention Of The Wheel, Writing, Pyramids Of Egypt, Maya Civilzation, Monotheism, Greek Expansion, Unification Of China, Roman Empire, Common Era, Arab Conquests, Middle Ages, Mongol Empire, Renaissance, Industrial Revolution, WWI (World War 1), WWII (World War 2), Man On The Moon, and the Human Genome. Other events are looked at in detail but each of these areas represent a given time period. When selected they will refer to other historic events of the same era. If you’re a teacher, parent, student, or simply someone who wants to expand their general knowledge then this app is for you. The price of this app is adequate given the accuracy and beautiful presentation. 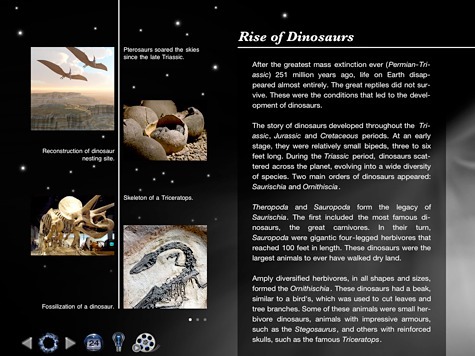 The app is complete with amazing facts that will allow you to entertain family and friends for countless hours. My only disappointment is that for people with a passion in history the amount of detail is limited. It would be nice in a future edition of the app for the developer to expand not only the internal offerings but perhaps hyperlink to outside articles, videos, and audio files so the educated consumer may delve deeper into the experience without leaving the app. Therefore I am awarding this iPad app a MyMac.com score of 9 out of 10.